View TFI 2015 Conference Slides, Videos & Pictures Online! Thank you to everyone who made the 10th Annual TFI Technology Communications for Asset Valuation Conference in January 2015 such a roaring success! The videos and slides for the Conference have been posted and, as is tradition, we have the wonderful pictures on our conference Facebook page. A special thank you to our panelists, speakers, and keynotes. And we couldn’t have done it without our generous sponsors, AUS, CostQuest and Deloitte! 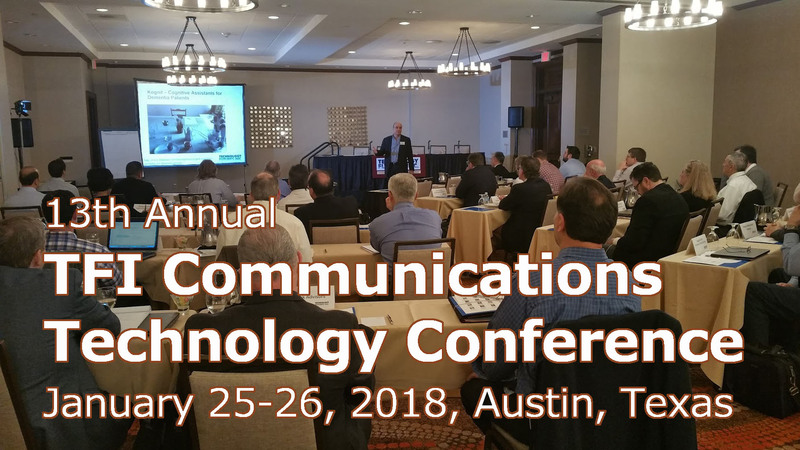 We are looking forward to our 11th Annual TFI Technology Communications for Asset Valuation Conference on January 21-22 at the Courtyard Marriott Downtown Hotel in Austin. Our popular Pre-Conference Seminar will be on January 20. In addition to 2015, we have conference videos and slides from 2014, and photos from 2009, 2010, 2011, 2012, 2013, 2014, and 2015. And if you haven’t already used the research resources on this site documenting trends and developments impacting technology assets of the communications industry, be sure to look around. Thanks and we hope to see you in 2016!